In Lucky Peach's All About Eggs, there's a photo of "Michael Anthony's Tamagoyaki." It looks so special: a rectangular, mid-century modern-ish spiral-layered omelet. I instantly wanted to make it. 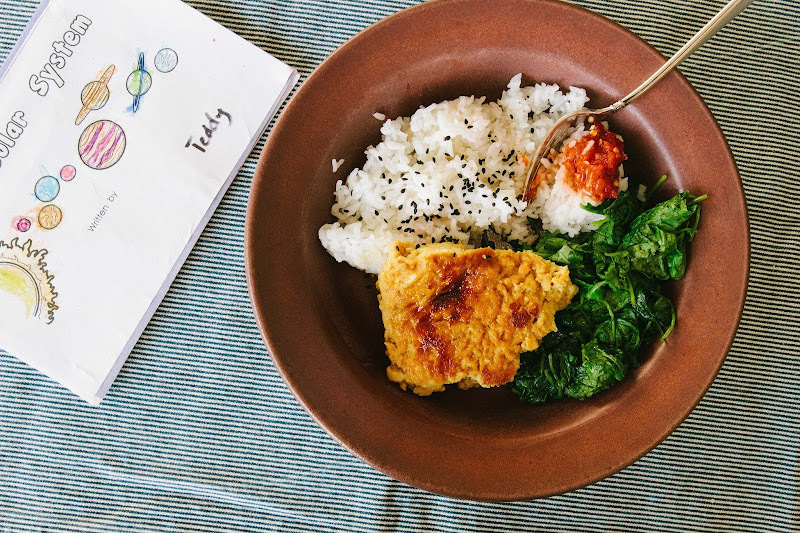 "My mother's tamagoyaki defied all tamagoyaki conventions. She didn't bother making the spirally layers. She didn't even own a square pan. 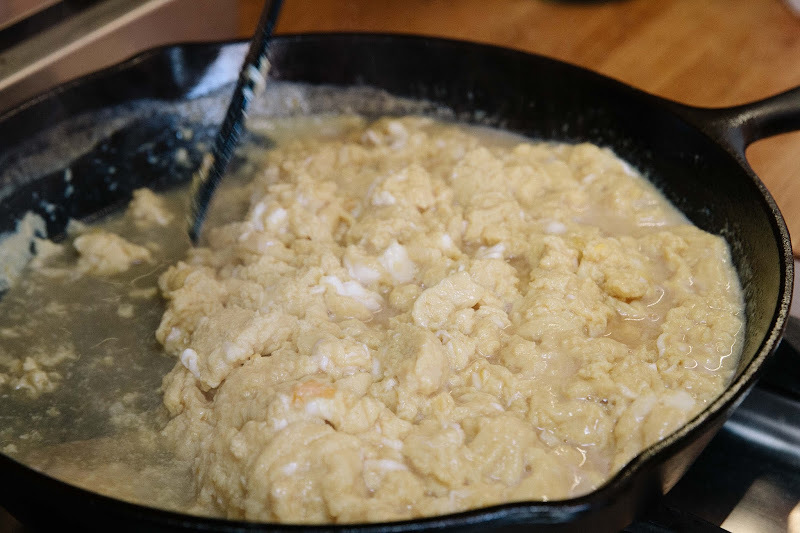 She used a round 10-inch cast iron skillet to make a communal tamagoyaki. Hers was basically scrambled eggs packed together like an ugly pillow. She called it shinzo-yaki ('pan-fried heart), and sure enough, it looked like an organ... Every time I watched my mother make this tamagoyaki, it looked like a disaster. But she didn't seem worried. She was a brave cook." It's written by Sonoko Sakai. I had never heard of her before but now consider myself a fan. I love the way she writes about her mother. And from her description, I love her mother too! (It looked like a disaster. But she didn't seem worried!) 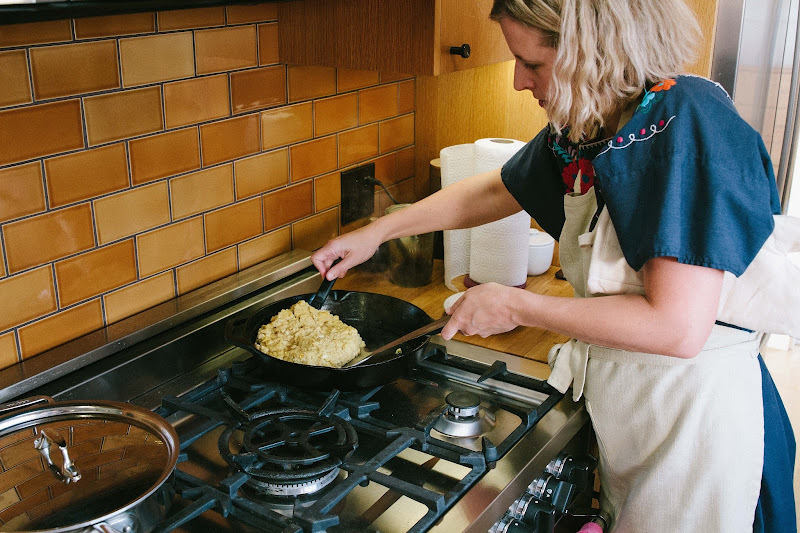 She feels like an embodiment of what Tannaz and I were talking about re: women and mothers and their practical magic, in the kitchen and far beyond. Indeed, this dish does come together quite magically. It also does look like disaster for most of the cooking time. But then eventually, it begins to shape into something. And then you flip it and see how the underneath has gotten all caramel-y and amazing. I really, truly enjoyed making this. Sadly, Matt didn't love how it tasted. He thought it was too sweet. I thought as long as you paired it with some rice, vinegary greens, and vinegary hot sauce, it was quite delicious. In fact, since Matt didn't eat much of it, I ate the leftovers over the next couple of lunches (as I am a practicing practical woman), wrapping it alongside rice and avocado dressed in rice vinegar inside a sheet of nori, and I was very very happy. Lastly, re: the first photo up there, Teddy's been learning all about the solar system, or as he would say it, "the saw-ler system." It's spurred so much conversation around here, like did you guys know the sun is eventually going to burn out and die? I didn't! Or else, if I did, I forgot. Speaking of dying, within two minutes of having picked him up at school, Teddy asked me: "When am I going to die?" I said that I didn't know but hopefully not for a really long time. He followed this up with: "And when I die, everyone dies?" Alkjdfljkafdaaflkakjfdljkafdladfljkafljkaflkjlkajfd. Whisk the eggs, dashi, sake, sugar, soy sauce, and salt in a large bowl. When there is only syrupy dashi left in the skillet, and the bottom of the omelet is caramel colored, carefully flip the tamagoyaki and caramelize the other side, about 5 minutes. Carefully transfer the tamagoyaki to a cutting board. Let it cool slightly, then cut it into square or rectangular pieces and serve it with grated daikon radish, if desired. I love the sawler system! 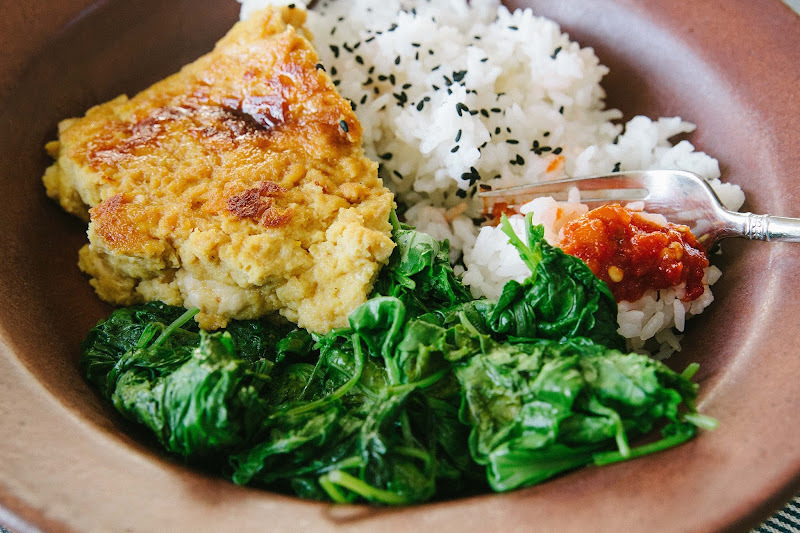 I love an egg, rice,& greens combo any day and I would feel up for a messy but delicious dish (e.g. most of my cooking).I didn't get to comment on the last post. Way to bravely call out the editor's crappy behavior! Round of applause, mama! You earned it. This recipe looks delish and also intriguing... might be one for when it's just me. How do the leftovers go?